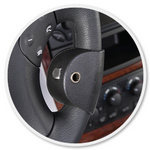 The low design allows for the fingers to be in constant reach of the turn signal switch, cruise control, etc., at the same time. Available in four colour choices. The round knob is available in four colour choices and two sizes: 40mm or 50mm. Uses the same handle as the Carospeed Menox hand control, for individuals seeking compatibility with the hand control. Available in four colour choices. Quick release, available in two colour possibilities (black/grey). Suitable for Menox steering knobs. Ability to control for different functions, such as turn signals, headlamps, windscreen washers, or chosen functions. Operation of channels 1-3: one press engages, while a second press disengages. The fourth channel remains engaged only while it is pressed. These RF’s are available in four and eight function options. A two or three pin steering device for individuals with impaired hand function. Can easily be reshaped to fit the hand.